SANTA CLARA, Calif. – Yoeli Childs finished just short of a triple-double as BYU beat Santa Clara 84-50 Saturday night in the Leavey Center. Childs had 22 points, 13 rebounds and a career-best eight assists for the Cougars. Elijah Bryant also had a double-double with 14 points and 12 rebounds. BYU (15-4, 4-2 West Coast Conference) shot a season-high 62 percent from the field and held the Broncos (6-12, 3-3) to just 34 percent. Childs had nine of BYU’s first 11 points as the Cougars led by one point early. Five minutes later, Childs made a layup to up his total to 15 points and give BYU a 24-16 lead. Jahshire Hardnett buried a 3 and Luke Worthington made a left-handed shot off the glass to make it 29-16 a little more than halfway through the first half. With 5:30 until halftime, TJ Haws hit a 3-pointer to extend the Cougars’ lead to 36-18. He made one three minutes later for a 44-26 advantage. BYU headed to the locker room with a 46-28 lead after shooting 79 percent (19 of 24) from the field. Haws made two 3-pointers early in the second half for 14 points on the game and a 52-31 Cougar lead. Childs scored off an inbounds play five minutes into the second half and completed a 3-point play at the foul line to make it 60-35 for BYU. With 10 minutes remaining, Childs connected his eighth assist with Zac Seljaas, who made an easy lay-in for a 66-36 lead. Hardnett made a free throw four minutes later to give the Cougars their largest lead of the game at 74-36. BYU coasted over the last several minutes of the game to the 84-50 win. The Cougars return home to play against Loyola Marymount on Thursday at 9 p.m. MST. That game will be televised on ESPNU with radio broadcasts on BYU Radio (Sirius XM 143) and KSL (102.7 FM and 1160 AM). 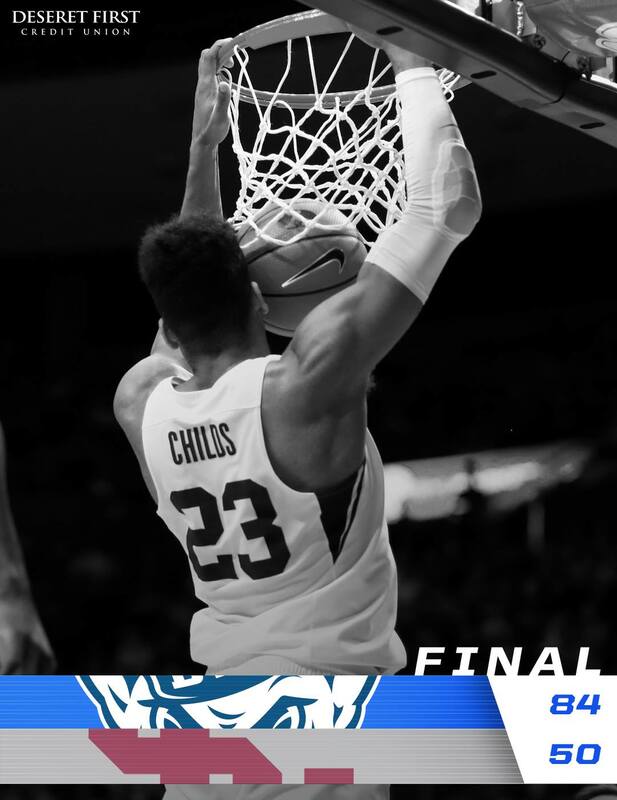 Yoeli Childs finished the first half with 17 points, six rebounds, six assists and two blocks. Childs shot 7 of 9 from the field, 3 of 3 from the free-throw line in the first half. He finished the game with 22 points, 13 rebounds, a career-best eight assists and two blocks. This was the second-straight game and eighth this season Childs scored 20-plus points. It was also his second-straight and ninth double-double of the season. Childs has scored in double figures in 17-straight games. TJ Haws made four 3-point field goals, the fourth time this season and 20th time in his career he has made three-plus treys. He finished the night with 14 points, his 12th game this season scoring in double figures. Elijah Bryant totaled 14 points, 12 rebounds, two assists and one block for his second double-double of the season. Luke Worthington shot a perfect 4 of 4 from the field for eight points. He added two rebounds and a career-best three assists. Jahshire Hardnett tied his career high with five assists. BYU shot 79.2 percent (19-24) from the field in the first half and had streaks of five-straight makes and eight-straight makes. It was BYU’s best shooting half of the season and the best since Feb. 20, 2016, vs. San Diego in Provo. The Cougars hit 20 of 28 (71.4 percent) in the second half that night. BYU shot 61.5 percent for the night, a new season high. BYU had a new season high 26 assists on 31 field goals. BYU defeated Santa Clara 84-50. The 34-point margin is its largest of the season.